Bermuda Farmers' Market was earlier known as City Market. It started in 2002 to boost Bermuda's focus and interest towards the best agricultural and farming products. Held on Every Saturday between 8am to 12 noon (November to June), the market has flourished far beyond its original goals. It's held like a Bohemian street festival - you will see lots of Bermudians flocking to the farmers' market on Saturdays with their casual Bermudian dresses. It was earlier held at Hamilton City, now it has been shifted to the JJ Outerbridge building at Botanical Gardens, Paget. So what can you buy at the farmers market in Bermuda? Vendors from all over the island come here to display and sell their products. They include farmers, fishermen, artisans offering locally made crafts and even backyard gardeners. The theme here is 'home made' or 'home grown'. Which means you can expect lots of locally made items and produce. You can buy from assortment of home made jams and jelly, banana bread and fresh honey and even sample them. Goodies like handcrafted soaps and honey extracted from the pollen of island wildflowers are for sale. Have a sip at the hot chocolates or drink freshly brewed great coffee. You will also see people buying and chewing sugar canes. Fresh fruits and vegetables range from pawpaws and pumpkins to collards. There are stands for poultry and eggs, dips, pestos, pates, and home-baked goods. Often fresh fish is on sale here. There are arts and crafts products also on display and these are becoming increasingly popular in the Farmers Market. Items include Venetian glass jewelry, scented candles, greeting cards, needlecraft and handbags. 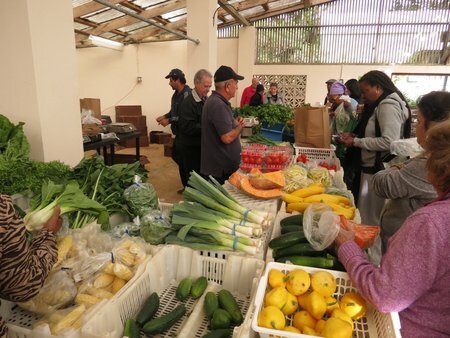 So if you are a visitor and want to have a first hand feel of what a typical Bermudian market is all about and what the Bermudians themselves love to buy, then surely visit the Farmers Market. Also if you are staying in an apartment in Hamilton area with a kitchenette in your room, you will find lots of things to buy from here and load your refrigerator. Update December 2017: This year it has been the largest Farmers Market compared to the past several years. There are 42 vendors this year showing the produce of their hard work. Open: 8am – 12noon, every Saturday, December 2, 2017 – June End, 2018 (except during the Annual Exhibition). Venue: JJ Outerbridge Building at the Botanical Gardens, Paget. Bus routes for Botanical Gardens: #2 (operates between Hamilton and Paget), #7 (operates between Dockyard and Hamilton), #1 (operates between Hamilton and St. George). The South Shore Road entrance is convenient for car parking as it's quite near the JJ Outerbridge building. Update January 2015: The Farmers' Market (earlier known as City Market) has again changed its venue from Pier 6 at Hamilton to Paget and therefore the change in its name. It is now held at the JJ Outerbridge building at Botanical Gardens. Atmosphere here is relaxing while you explore the market at leisure and the children can safely play and enjoy at the garden. It has been a welcome change of venue for both vendors and patrons. Update January 2014: City Market venue has been shifted to Pier-6, Front Street, Hamilton City. Update January 2013: The City Market starts on November 16 and continues to attract local marketers in large numbers on Saturdays. This year the main items on sale have been fresh vegetables & fruits, local flowers & plants, sweet honey, fresh baked goods, jams & jellies, knitted goods, unique jewelry, ceramics, handmade cards, tea & tea accessories, kids area etc. Update November 2011: The City Market venue in Hamilton City has been changed. It is now held on an open lot on Washington Street and across Pasta Basta. This place has been found more suitable by the Hamilton City authorities because of its large vacant space created for this purpose and also for the ample parking space available here including the Bull's Head Car Park. Incase of bad weather, the City Market will be held at the second floor of Bull's Head Car Park, Canal Road, Off Woodlands Road.